There is no doubt about it: Winning a $15 per hour minimum wage for Seattle workers would be a small but significant victory for the entire working class. It would increase the standard of living for many workers who are struggling to survive. Maybe even more important, it would be a step in reversing the decades long offensive of Corporate America, and thereby it would raise the morale – the fighting spirit – of workers. This would help set in motion further struggles of workers. Corporate Seattle is rallying the opposition to this initiative for two reasons. First of all, it will cut into their profits. The owner of Julia’s restaurant chain complains: “If a mandatory $15 an hour wage would kick in we would have to raise prices accordingly, most likely cut our work force, and trim hours of operation, making it even more difficult to be profitable, maybe even close our business.” Like every other restaurant owner, Julia’s restaurants owners is not in business to serve food; they are in business to make a profit. If they can boost their profits by cutting workers now, they will do it. If they can boost their profits by cutting hours of operation now, they will do it. Their real problem is that, as they say, a $15 per hour minimum wage might even make it “more difficult to be profitable” — meaning it could reduce their profits. Will 15 Now Lead to Cut in Jobs? The article also confirms what the owner of Julia’s fears – a cut in profits. They describe one owner of several Carl’s Jr. franchises, some in San Jose and some outside of it. This owner now charges $6.19 for a burger, fries and a drink in San Jose (vs. $5.99 in Santa Clara), but he would have to charge $6.75 in San Jose to make up for the higher pay there. He lost some of his profits, in other words. To put it very simply, the struggle over minimum wage – and over wages in general – is a struggle over how much “surplus value” goes to workers and how much goes to the employer. It is a struggle over competing and conflicting interests. And this is exactly what the employers, the owners of capital, and their mouthpieces fear – that this struggle will increasingly break out in the open and raise the awareness of these competing interests on the part of workers. Seattle: One Big Happy Family? Corporate America and their representatives fear the struggle just as much as they fear any ultimate outcome. 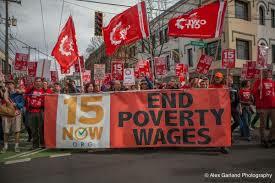 The main opposition to 15 Now in Seattle gives the game away simply in their name alone: “One Seattle Coalition”. In other words, we – workers and employers – are all one big happy family with common interests. An article posted on the One Seattle web site is most revealing. However, in physics for every action there is a counter-action and in the world of the class struggle, for every victory of the working class there is a counter attack by the employers. An increase in the minimum wage is no exception. Any such increase will tend to lead to an overall increase in wages. If an employer pays some workers $10 per hour, for instance, and pays other more skilled or longer term workers $12, he or she will tend to have to maintain that wage differential after the minimum wage increases to $15. In the short and medium term, this will lead to a redistribution of wealth downwards, reversing the longer term trend of redistributing wealth from the workers and the poor up to the top capitalists. What form is a counter attack of the capitalists likely to take? They will increasingly send manufacturing and high tech jobs overseas to low wage countries like China, India, etc. This, then, will put downwards pressure on all wages in the US, just as it has over recent decades. Corporate America argues that this means that it is useless to fight for higher pay. Nothing could be further from the truth. One pay cut simply leads to another, driving down the living standards of the working class to one level grey mass, ultimately heading towards complete immiseration. Accepting pay cuts, or not fighting for better pay, demoralizes workers and makes many times more difficult launching a counter-offensive for a changed society altogether. (Should ) the working class… abandon their attempts at making the best of the occasional chances for their temporary improvement? If they did, they would be degraded to one level mass of broken wretches past salvation.… By cowardly giving way in their everyday conflict with capital, they would certainly disqualify themselves for the initiating of any larger movement. The fight for an increased minimum wage has to be broadened out; it has to draw in all sectors of the working class, and to do so means connecting it with related issues. First and foremost, it means relating the issue of the minimum wage to the issue of wages as a whole for all workers. In the US, the main organizations that workers have built to improve their living standards have been the unions. But today the unions are locked in a strangle-hold by a leadership that is in the main the mouthpiece of the employers – “the labor lieutenants of capital” as the old time socialist Daniel deLeon called them. Seattle’s own David Rolf of the SEIU is a prime example of this. Courted by One Seattle for good reason (see above quote), he has explained why he supports excluding union workers from a $15 per hour minimum wage ordinance: “We always want to offer an olive branch and a high road approach to employers of conscience who prefer to have direct and honest relations to unions that they are facing across the bargaining table so, yes, we hope that amongst the unions that are active at the airport that if workers choose to join those unions we want to facilitate and encourage productive, bilateral bargaining agreements,” he said. It is exactly because of this attitude that Corporate Seattle, in the person of One Seattle, recognizes that they have to give the David Rolfs of the union movement a few concessions – to allow them to maintain control over their members and over the working class in general. And it is exactly this thinking that will tend to be discredited by building a mass movement for the $15 per hour minimum wage. End the team concept, (the concept that union and the employer are on the same “team”). No concessions, no cuts in pay or benefits. Link the contract struggle with a mass, rank-and-file based campaign to organize the unorganized. For international solidarity in deeds, not just words, including direct links between workers in the same company and the same industry around the world through the internet and by direct visits; a strike against a company or an entire industry in one country means a strike against them everywhere. 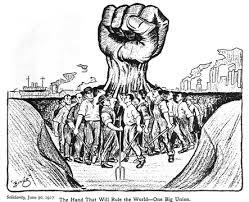 Link the struggle of union workers with the struggle of oppressed groups to build solidarity; union support for prisoner rights, for immigrant rights, against police brutality, for the rights of specially oppressed minorities and women, etc. For workers candidates and a mass workers’ party in the United States. As sailors say, “it’s not the destination; it’s the journey”, and what is true for them is 1000 times more true for the class struggle. It is what is to be learned, how the class consciousness increases, that is at least as important as the temporary victories. * – We are happy to see that Socialist Alternative and 15 Now did not include the union exclusion clause – known as the “collective bargaining opt-out” in its initiative. It was long unclear what their intentions were on this. This inclusion would have been a serious mistake. As for the other concessions – the three year phase in for employees in businesses of up to 250 workers and in non-profits – from this distance here in Oakland it is difficult to have a definite opinion although if these concessions are made more to attract a wing of the union hierarchy than to attract workers we think it is mistaken. For a more fleshed out strategy and program for a minimum wage campaign that is not oriented to the union hierarchy, see here. I probably first read one of your comments on the well-known “89 percent” thread on the Black Orchid blog in the wake of the Port Shutdown action in 2011. More recently, I have been reading your posts with great interest since Art showed me yours from April 3 (“The Minimum Wage, the Democrats, the Union Leadership and Kshama Sawant”). Our movement needs people with experience in the movement, and experience with the kinds of bitter betrayal from the trade union bureaucrats and their allies that are common in the movement. Our movement needs people with this experience to write about the historic events which are taking place at this time. I want you to know that I am committed to this kind of open and comradely discussion. This kind of discussion is not only immensely helpful–it is necessary. Our biggest priority at this time is simply to understand what is happening and why. When we understand these things–then the things that we need to do to bring the movement forward will become more clear. And we will never be able to develop this understanding without this kind of discussion. I only have a few minutes to put this post together–so there are many thoughts I have that will need to wait. But I will note that one topic you write about is the kinds of compromises that Kshama and the 15Now campaign are making. Some compromises are necessary–and can increase the probability of victory. Other compromises undermine the movement, represent capitulation to the dictate of the trade union bureaucrats and other false friends of the movement–and will undermine mass support and pave the road to defeat. You write that, from the distance of Oakland, it is not always easy to tell which is which. I live in Seattle and I often cannot tell either. But I read the news and discuss these things with Art–who is the only activist who will meet with me on a consistent basis to talk about the most important questions of the movement. The events of the movement are complex and we can only understand them by means of consistent discussion, over time, of those things which are most important. There are many barriers to the kind of discussion that we need. In general, we can say that the proletariat will overcome these barriers. And we can be part of this process which, like the campaign for $15 hour, will in its own way be part of the history of our class. 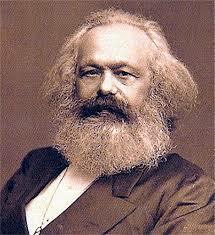 By the way, I liked your quote from Marx. We must fight for $15. But we can never allow ourselves to mistake this kind of fight for the larger fight we must wage for the consciousness and organization which our class needs. I just posted this on my blog concerning the 15 Now campaign and the compromises which they may be pressured to make in the near future. I would be quite interested in your thoughtful criticisms, questions or comments. This letter (with new graphics) is intended to be a summary of what Art and I learned at the “15 Now” organizing group meeting yesterday, as well as related observations we have made.